Tony Kart produces high quality racing kart chassis. A catalogue of their kart chassis can be found on their website. 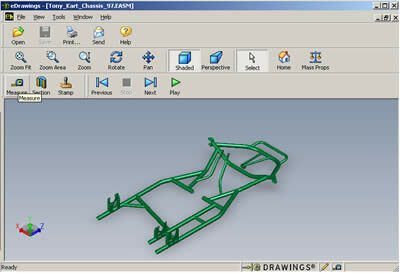 A particular chassis model, a Tony Kart Extreme ’97, was modelled using SolidWorks, and is available for download. Below is an overview of the chassis, in isometric and in a plan view. This chassis is modelled perfectly in SolidWorks, with each member as an individual part and fully in-context. With the complete assembly and part files, it would be very easy to create 2d drawings of the chassis. The chassis is full size, so no scaling would have to be carried out. Perhaps in the future the author will complete a fully dimensioned chassis using SolidWorks. Please contact the author if you have any queries etc. regarding this. The SolidWorks assembly file can be downloaded from its original location here, along with some other CAD drawings also. A backup local copy of the SolidWorks chassis is also available. Note: the eDrawings download of the chassis contains a self executable viewer application. 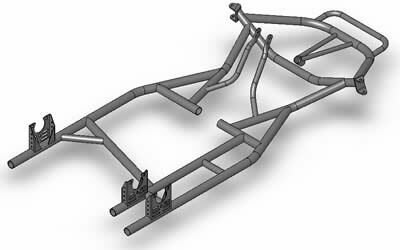 Hopefully the detailed professional chassis design will give you ideas on how to design and create your own chassis. An idea of the size of the chassis design can also be obtained using the eDrawing. Best of Luck!